A perturbed Ken McMullen, fading holdover from an earlier, more cleancut era in baseball, has just noticed a couple of unusual figures in the stands. A couple of freaks. I can’t know this of course. All I can know is that Ken McMullen, at the time of this 1975 card, had been kicking around the league for twelve years. He started out with the Dodgers in 1962 but was traded to the second incarnation of the Washington Senators after three seasons and 311 at-bats. He had several productive years with that team, establishing himself, most likely (I’m too lazy too research it), as the greatest third baseman in the entire doomed and desultory eleven-season history of the second edition of the Washington Senators. 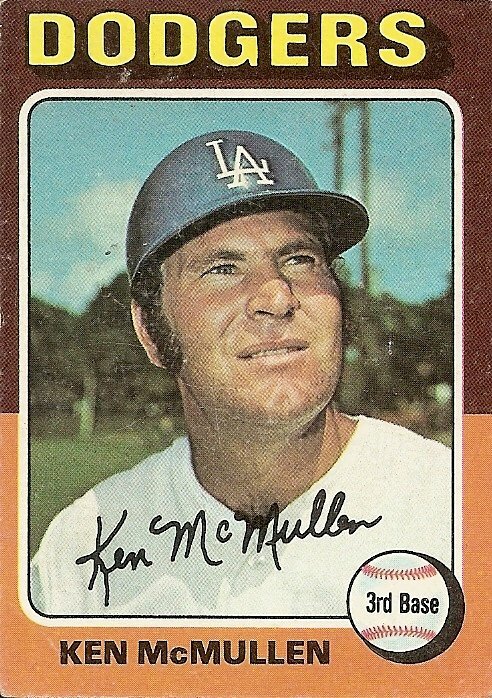 The Senators shipped McMullen to the California Angels during the first season of the new decade, and in 1973 he came back to the Dodgers, the team of his early major league career and possibly the team of his youth, judging from the fact that he was born in Oxnard, CA, and was still calling it home at the time of this card, suggesting that he had lived there all along and so was there, an impressionable cleancut teen, when the Dodgers relocated from Brooklyn to nearby Los Angeles in 1957. The story told by this card, or by all of this card except the enigmatic expression of the player on its front, could be a comforting one, a story about coming home, the onetime Oxnard-born Dodger an Oxnard-based Dodger once more. Any conjecture about his sour, apprehensive expression, which sends a negating shiver through whatever comfort is offered by the circle-of-life place names on the back of the card, is beyond the borders of the card, and nothing can be affirmed with any certainty about matters that are beyond the borders of the card. But nothing can be ruled out, either. Anything is possible. So I’ll say it again, as if it were true, because it might be, and in my always-diminishing world might is just about the only right: Ken McMullen, aging holdover from an earlier, more cleancut era in baseball, has just noticed a couple of unusual figures in the stands. A couple of freaks. One of them, a bushy-haired guy with glasses, is playing the wooden, flute-like instrument known as the recorder. The other is of ambiguous gender and swaying back and forth, eyes closed, either mumbling valium-inspired nonsense or chanting. Ken McMullen can’t make heads or tails of any of it. His world is changing all around him. Getting stranger, harder to understand, worse. He’ll end his career not as a Dodger but far away, in Milwaukee. “Goddamnit, what the hell,” he is about to say. 2. Ah, the team of my youth. The 1969 Washington Senators, the team that Ted Williams taught how to hit. Or maybe it was the mound change. Either way every night my transistor radio and I went to sleep together. The West Coast games were tough for a boy in Alexandria but I usually caught the whole game. I followed McMullen across country. When he got traded to the California Angels, my family left Alexandria for Glendale, CA. I think he was staring at me wondering why this kid keeps following him around. 4. “Goddamnit, what the hell.” I agree man. 5. His name was Ken. My name was Ken. He wore number 5 for the Dodgers. I wore number 5 for the Shawsville Shawnees. We both rode the bench. Davey Lopes was my favorite Dodger, but I still have irrational affection for Ken McMullen. 6. He is looking for that big Dodger in the sky to complain about being shipped off to Washington. 7. Given the look on his face I envision a fan in the crowd going off on a venom-filled tirade against the Dodgers. His look is of someone who can’t believe that someone would harbor that much hate over a baseball team. The fact that the background suggests a spring training game only increases his disbelief. 8. I don’t remember all the details, but the latter part of McMullen’s career was very sad, as he played a season, I believe with the Dodgers, while his wife was dying of cancer. 10. I had the opportunity to work with Ken on his golf tournament in Ojai, California years ago. He devoted a lot of time and effort to make this event a major source of funds for youth agencies in Ventura County. Have fun with his picture, but just for the record, he’s one of the nicest, most honest guys you could want to know. Unlike a lot of overpaid athletes we see today, Ken took his place as a community leader and role model for kids after his playing days were over. I attended Hueneme High in Oxnard, CA in the early 1970’s. Ken came and practiced with our baseball team in 1972 when the MLB went on strike at the start of the season. In late 1973 or early 1974 I happened to be attending United Methodist Church in Oxnard and Ken was sitting right behind me. His wife had just had a baby and he gave me a cigar. His wife had been diagnosed with cancer during her pregnancy, but refused treatment until after their child was born. In 1974 she lost her battle with cancer. Ken was very kind and gracious and his wife’s actions were courageous. Thank you everyone who posted kind comments about Ken. I do know Ken, very well as I was married to that baby you saw him in the church with in 1973, his name is Jon. And yes at the time this pic was taken for this card Ken was going through a very difficult time as he has just lost his wife which was heart wrenching for him and now had to raise their 3 children. Ken is a very kind and loving man and always does things for the community of Camario California where he has resided since 1974.